Windows come in a variety of styles each with its own unique features. So, in order to make the most of your window replacement in Brampton, Ontario, choose the style that best matches your home’s existing décor and improves energy efficiency. Double and single hung windows are two popular options for today’s Brampton homes. There is only one main difference between the two, and that is how the window sections move. Single hung windows have a bottom panel or sash that moves up and down while the upper sash remains stationary. On the other hand, with double hung windows, both the upper and lower sashes can be moved up and down. This provides more flexible operation and uses. Double hung windows can be tilted in for easier cleaning. Slider windows feature clean lines and a more streamlined look. Our North Star Windows include an advanced tracking system lets the sash glide smoothly for effortless operation. So, for comfort, easy operation, and strong performance, sliding windows are the right choice for you. Casement windows are the most popular style in new, high-end construction. They are hinged on either the left or right and open outward to 90° for optimum air flow. Beautiful and versatile, casement windows are an attractive choice for any home. Awning windows are your style of choice if you’re looking to improve your Brampton home’s energy efficiency. Awning windows are hinged at the top and swing fully open. They provide improved ventilation and fresher air quality while not forcing you to rely solely on your HVAC system for refreshing air circulation. Bay or Bow windows are a good style choice if you are looking to add more space to your living area. These windows have a deep sill area that adds space to your room. Both styles bow outward, opening your room. Bay windows are comprised of three sashes and give a more angular look. Bow windows are typically formed with 4-5 sashes providing a smoother, more “bowed” appearance. Picture windows are a great option if your home overlooks a stunning view. While they do not open or close, picture windows maximize your view through their expansive glass. They also bring great natural lighting into your room. We offer custom windows to ensure we can meet your exact style needs. Whether you need a custom size or design, we can build you made-to-order windows to satisfy your home and personal style preferences. There is nothing better than sitting inside your Brampton home and enjoying a beautiful view with the warm sunbeams shining through. Brock Doors and Windows has been helping customers enjoy the view through their new windows for over 25 years. We have the expertise to help you choose the window style that will enhance your home’s appearance, performance and energy efficiency. 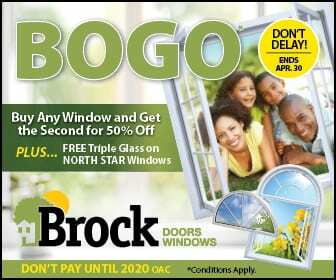 Brock Doors and Windows is your clear choice for all your window needs.